Paterson Community Schools Corps (PCSC) AmeriCorps Members at Paterson School #2 (PS2) will dedicate 850 service hours, over one year, to assist clients with educational enhancement, social/emotional development, and family engagement. Service Site at PS2: PS2 is a neighborhood K to 8 elementary school with about 600 students. One of the unique aspects of PS2 is that it is a primary school designated for children with designated classrooms for children with disabilities, and in particular children with autism. NJCDC is launching a new after-school program at PS2 for children with autism. The after-school program will operate four days per week (Monday through Thursday) from 3 to 5 p.m. We will host 4 half-time AmeriCorps members at this program site that will serve Monday through Thursday from 11:30 a.m. to 5:30 p.m. daily (six hours per day, four days per week for a total of 24 hours per week). In addition to providing programming during the after-school program, and supporting vendors that are providing the programming, AmeriCorps members will provide in-class support. Programming will be targeted for kids grades (5 to 8). We seek members that are interested in working with special needs students and supporting their healthy development. Provide daily instructional support to classroom teachers, including one on one and small group student sessions. Coordinate a comprehensive case management system for students requiring additional assistance in areas, such as homework, social/emotional development, personal growth, college applications, etc. Plan and implement daily after-school programming for students, including a homework help program, clubs, trips, service learning projects, and extracurricular activities. Conduct youth developmental workshops utilizing community partners and agency resources. Foster opportunities for collaboration between the PCSC, service sites, NJCDC programs, and external organizations. Facilitate parental involvement and healthy home environments by coordinating events for parents and families. Build new, and strengthen existing, partnerships for NJCDC’s Annual Holiday Gift and Food Drive, by acquiring donations and engaging volunteers. Coordinate National Days of Service including Make a Difference Day, MLK Day of Service, and Global Youth Service Day. Coordinate large scale events with service sites and host agency. Keep documentation current. This includes sign-in sheets, timesheets, daily logs, Efforts to Outcome data, student profiles, evaluations, and surveys. Maintain professional standards including confidentiality, proper role modeling, and appropriate dress. Attend NJCDC and Program site meetings and training sessions. 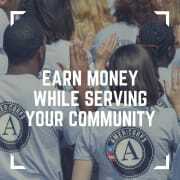 Attend AmeriCorps week and events sponsored by the New Jersey Commission on National and Community Service. Members receive a monthly allowance of up to $605 for Members before taxes. An education award of up to $2,960 at the completion of their term of service. Loan forbearance on qualified Department of Education loans, and interest payments after the completion of a term of service. Full time members receive health insurance through Cigna’s Corps Network health plan, including health, dental and vision care. Up to 21 days of personal/vacation time. Full time members receive up to 340 hours of professional development and training, including a two week orientation with compensation. A Bachelor’s degree, for full time service. An Associate’s degree, or two years of college experience, for part time service. Proof of citizenship or permanent residency. 850 hours over the course of one year. Monday-Thursday 11:30 a.m. - 5:30 p.m.